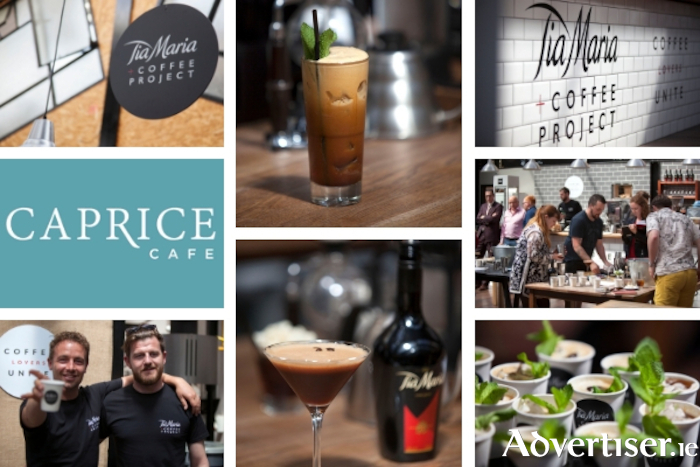 Advertiser.ie - COFFEE CULTURE MEETS COCKTAIL HOUR FOR THE TIA MARIA COFFEE REVOLUTION AT CAPRICE! Research shows that almost half of cocktail drinkers regularly choose flavoured cocktails including those mixed with coffee (source: CGA Mixed Drinks Report 2016 ). From the classic Espresso Martini, to new and innovative serves like the Tia Maria Mint Frappe, coffee cocktails have never been more in demand. Tia Maria is leading this trend with the launch of the Tia Maria + Coffee Project and a selection of new serves that unite coffee culture and cocktail hour. Coffee connoisseurs can now sip on cocktails unlike anything they’ve ever tasted before, thanks to new recipes crafted by renowned mixologists and expert baristas. As part of this Tia Maria + Coffee Project, Tia Maria launched an on-trade initiative, The Academy. As a coffee training and education programme, The Academy is designed to help managed outlets, independent bars, and coffee shops perfect their coffee cocktail serves. This year The Academy - a coffee cocktail immersion and masterclasses will take place in the super stylish Caprice Café in Galway. Strong and sweet, sharp and velvety at the same time, the complex aromatic structure of Tia Maria derives from the distinctive fresh notes of the premium coffee; the intense richness and Caribbean flavour of the Jamaican rum; and the softness and roundness of the Madagascar vanilla. Rich copper and golden amber tones blend with an enticing caramel nose to make Tia Maria the essential ingredient for delicious coffee cocktails. The story of Tia Maria dates back to the mid-17th century. When a beautiful young Spanish aristocrat fled the turmoil that colonial war brought to the island of Jamaica, her maid saved one family treasure, a small jewellery box with black pearl earrings and an ancient manuscript with the recipe for a mysterious liqueur. The recipe was named after the courageous woman: TIA MARIA. It was then rediscovered in the 1950s by Dr. Kenneth Leigh Evans, who began to produce and market it. It is still produced according to the original Caribbean recipe by ILLVA Saronno and is now distributed in over 60 countries, with Ireland being a key market.